Synopsis: My name is Meghan Chase. In less than twenty-four hours I'll be sixteen. Countless stories, songs and poems have been written about this wonderful age, when a girl finds true love and the stars shine for her and the handsome prince carries her off into the sunset. I don't think it will be that way for me. Something has always felt slightly off in Meghan's life, ever since her father disappeared before her eyes when she was six. She has never quite fit in at school...or at home. When a dark stranger begins watching her from afar, and her prankster best friend becomes strangely protective of her, Meghan senses that everything she's known is about to change. But she could never have guessed the truth - that she is the daughter of a mythical fairy king and is a pawn in a deadly war. Now Meghan will learn just how far she'll go to save someone she cares about, to stop a mysterious evil no faery creature dare face...and to find love with a young prince who might rather see her dead than let her touch his icy heart. 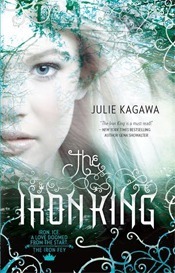 The Iron King, written by Julie Kagawa, is a fictional adventure book based on the ancient characters of William Shakespeare’s A Midsummer Night’s Dream. It follows the sudden introduction of Meghan Chase, part of a poor “hillbilly” family. She lives with her mother, step-father, Luke, and half-brother, Ethan. As you may well imagine with stereotypes (they’re not true, I live in the country…), she’s left pretty much alone apart from her mysterious friend Robbie Goodfell, who, if you know the original story, is actually Puck (Robin Goodfellow). As with quite a few good stories – I know for example it’s Zizou Corders’plan in writing; an adventure starts when you take something from the (main) character. This book certainly follows this trail, as Ethan is swapped by a member of the faery land (he’s not very nice). Robbie decides to show Meghan the way into the nevernever, therefore starting the adventure that includes Cath Sith, evil iron and extremely attractive enemies you shouldn’t fall in love with… yeah, you know where this is going. Although the face-to-face plot is pretty simple and unoriginal, I can relate and like the implied idea of technology. Basically the ideas are that the faeryland is dying, because people don’t believe anymore in the stories of old, but have changed to the iron (therefore technology) way of life. Technology is taking over our lives and destroying places of beauty, but also our belief in dreams, tales; it’s now all about science. It’s a thought provoking idea, but I’ll leave off my belief of evil technology (as I type this on my laptop) because you will have me down as a hillbilly! The characters aren’t especially original, but the context is good in the way that Julie has explored the humour related to talking animals, tiny goblins and egotistical faeries. Puck presents himself well and he generally makes the book a livelier and less dull & dreary place to be, as Meghan is a damsel in distress looking for her brother, with nothing more about her than her strange attraction to making promises… of her first child… (she’s clearly not very clever). My favourite probably has to be Grim, the Cath Sith, who sporadically makes an appearance when danger isn’t around. His witty and sarcastic comments suit me down to the ground, I mean, who else better than a wicked fur ball? Although I do have to say this book is no world phenomena, it’s got some really interesting bits in it which keeps you interested to read on, if not rush to the somewhat predictable finale. I do have to praise the publishers Mira Ink for a really eye-catching and beautiful cover; it’s what stood out for me when I picked it off the shelves. Generally, the story flows at a constant rate with a suitable amount of description but not enough for you to fall asleep. In conclusion, The Iron King is a good bog-standard fiction book based on Shakespeare’s A Midsummer Night’s Dream. It’s funny, flowing and easy to follow yet there are no surprises for an experienced fiction lover. I probably will go out – or maybe get from the library – the latter books in the series as the storyline of evil technology interests me, so I’m curious to see how Julie tackles it. With all that in mind, I would lightly recommend this to avid readers: but don’t except anything special, as this follows the normal system of masses of adventure-fiction gone by. This review was written by Michael.